Question: I read your article on fishing tandem rigs for trout. Does the same idea work for saltwater fishing? Answer: Actually, yes. 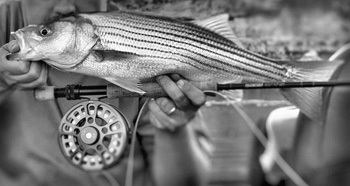 East Coast striper fishermen have long used multi-fly rigs as a way to prospect and to figure out what patterns and colors the fish are keying on. In a trout stream, you have lots of ways to figure out what the trout are eating: you can seine the current, turn over rocks, consult a hatch chart, or watch feeding behavior. When you’re double-hauling to fish just outside the breakers, you have to guess what’s on the menu. By throwing two (or more) patterns, you increase your chances that the fish will like what you’ve tied on. Keer argues that how you tie your multi-fly rigs should be determined by the effect you want to achieve. By tying each fly on its own tag end of a knot (the traditional method of multi-fly rigging), you can drift several different flies that represent different kinds of bait. So you can imitate a silversides, a blood worm, and a herring. The only caveat is that the largest fly needs to go at the end to anchor the setup. You can also tie the patterns in-line, in which each dropper is connected directly to the hook bend of the pattern in front of it via a length of leader material. This is a good way to imitate a school of baitfish or to employ a popper-and-dropper system, in which you use a surface fly and a sinking fly at the same time. Tom fishes as many as five flies at a time, but this can certainly cause tangling problems. You won’t be able to use that super-tight wind-cutting loop you’re proud of. Instead, you’ll need to open your casting loop or employ a Belgian or oval cast.